Yes we are, but not everyone is - we're very happy to welcome customers with dogs. Please pop in to the bar - we can get a little busy at weekends - to check if it's OK to bring your dog in. If it is possible to return your dog to your car before coming for a meal or a drink that would be very much appreciated. Thanks. With our warm, welcoming bar. Smart long dining room and three bedrooms, we are confident that you'll be comfortable and well looked after. The Long room is ideal for breakfasts, luncheons, and dinner parties, buffets or meetings. It’s a versatile space that can be used to host all types of occasions - wedding receptions, intimate candlelit dinners, private family occasions or formal entertaining. The room comfortably seats 15 to 35 people and we can offer distinctive buffets for up to 65 guests. We are now using airbnb to book out our rooms - find them here. Start your morning with a good breakfast, spend your day out in the fresh air on the moors then return to a welcoming fire, a well earned dinner and toast yourselves on your good luck and the beauty of the area. 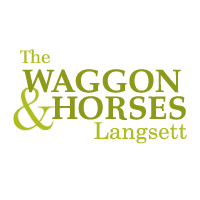 The Waggon & Horses is a place that is to be enjoyed by all. We hope that you will want to return to again and again for a pint, a pie or a nights stay. If you stay with us, you will be very well looked after; we have three good sized ensuite rooms, which can accommodate upto seven people. Each room has all you'll need for a comfortable stay. Room one has views of the garden, rhododendrons and fir trees, Rooms two & three overlook the village green and cottages.